With its flagship show put out to pasture, it’s safe to say the entire franchise is merely running out the clock. The superhero lights are going out all over Netflix. Once again, long after the sun had set, the streaming service canceled one of its high-profile Marvel shows, the third time in under eight weeks that Netflix has removed one of the franchise titles from the roster. The victim this time was the series that launched the enterprise back in 2015, “Daredevil,” widely believed to be the highest rated and arguably most popular of the six streaming series produced so far. With the flagship show put out to pasture, it’s safe to say the entire franchise is merely running out the clock. With the benefit of hindsight, the failure of the crossover series “The Defenders” may have been the first bell rung in the death knell of the franchise. The bloodbath began inauspiciously, with the cancelation of the least popular of the franchises, “Iron Fist,” in early October. But with the benefit of hindsight, the failure of the crossover series “The Defenders” may have been the first bell rung in the death knell of the franchise. What was once touted as the future of superhero shows is now inauspiciously disappearing in late-night news dumps. Today, only “The Punisher” and “Jessica Jones” remain. The latter has quietly admitted showrunner Melissa Rosenberg will exit after the third, and now assumedly final, season. The former, a far more nakedly reactionary series, should probably have never been given a second season to begin with. To be fair, there’s much blame to spread around. “The Defenders” was a weak outing that unforgivably wasted Sigourney Weaver and functioned more as a “Daredevil and friends” adventure than a true crossover. But Marvel TV’s continuing insistence that it make every season of every series 13 episodes long showed a poor understanding both of what the market would support and how to properly use the benefits of a streaming service like Netflix. Meanwhile, Netflix airing no less than four series this year (with “The Punisher” hinting at a release date in early 2019) meant that audiences were handed no less than 49 hours of superhero shows to watch between March and October, with another 13 to come before 12 months have passed. To say this was completely unexpected would be a mischaracterization, but Marvel critics and TV prognosticators mostly seem to agree this is a much faster removal than anyone could have foreseen. Obviously, the promised arrival of Disney’s competing streaming service Disney+ next year will turn former partners with benefits into direct rivals competing for subscriber base dollars. For Netflix, this is less a problem of rivalry and more as issue of content loss. The streaming service is racing to stack the decks with original programming, spending up to $13 billion dollars on the project. On the other hand, the ruthlessness with which Netflix is removing these Marvel shows suggests it is not ready to make nice with anyone who believes their name recognition is more valuable than the eyeballs they can attract. To say this was completely unexpected would be a mischaracterization, but Marvel critics and TV prognosticators both seem to agree this is a much faster removal than anyone could have foreseen. 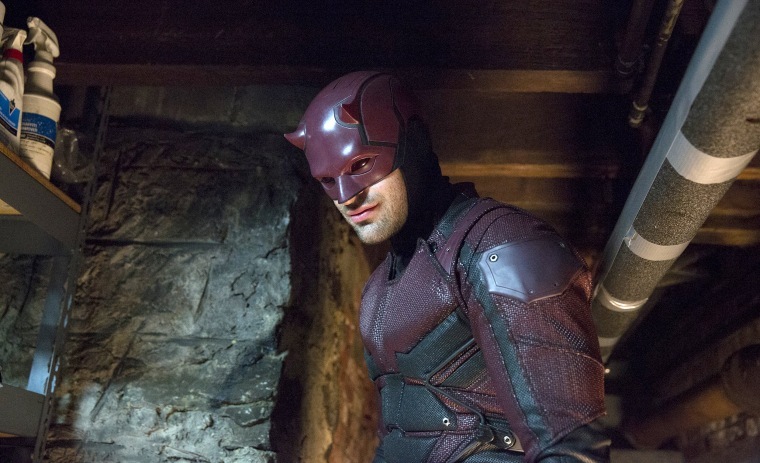 Fans of the Daredevil character can find some comfort in Netflix’s statement on the cancelation: “The Daredevil character will live on in future projects for Marvel.” And yet, there is nothing here to suggest the character will be returning to Netflix. Once all six series disappear from the production calendar, all non-Disney-owned Marvel Cinematic Universe TV shows will be gone. Everything else Marvel TV produces, including “Agents of S.H.I.E.L.D.,” “The Runaways” and “Cloak & Dagger” are run on Disney-owned properties: ABC, Hulu and Freeform. On Friday, Marvel released its own statement promising “more adventures with the Man without Fear in the future,” fueling speculation that the shows are actually leaving on Marvel’s orders so that they can be rebooted over on Disney+. But that’s not how things work. Disney and Marvel TV have no power to cancel these shows, that’s Netflix’s call. Moreover, Marvel TV seems to not be involved in the initial Disney+ launch. The shows that are coming first to the streaming service are instead being produced by the movie side of the production company, Marvel Studios. This entity has been known to speak of the TV side as inferior, suggesting the two sections do not get along. The shows Marvel Studios is working on, including a Winter Soldier and Falcon buddy series starring Anthony Mackie and Sabastian Stan, an unnamed Loki show featuring Tom Hiddleston, and the newly reported Scarlet Witch series will tie directly to the movies — using the same actors — for the first time since “Agents of S.H.I.E.L.D.” spun off in 2013. This strategy is bad news for Marvel TV, which is now left with a small set of shows that do not connect to the overall universe and are viewed as lesser or failed entities. “The Runaways” and “Cloak & Dagger” are viewed as teen-market shows only. “S.H.I.E.L.D.” may have started as a tie-in series, but falling ratings and reported personal animus forced Marvel TV to take it in a different, unconnected direction. (ABC has made sure to leak gossip that the renewal of “Agents of S.H.I.E.L.D.” is happening because Disney won’t let ABC cancel it, not because anyone watches it.) In short, there’s little reason to think there’s a broader strategy behind the Netflix cancellations. Frankly, this looks more like a body blow Marvel TV cannot afford. Netflix, on the other hand, clearly thinks it can afford to shake Disney off, as the exclusive streaming rights deal the two companies entered into back in 2012 ends at the start of 2019. Cutting ties is a calculated risk on Netflix’s part, but one that would probably have inevitably occurred once Disney+ launched. A fast divorce between giant companies is easier than a long, drawn out one, but the loss of these shows reminds us it’s the fandom who usually pays the price.